Managing Multiple Offer Situations: Should You Go with a Highest, Best, and NOT Final Bidding Process? As the market is heating up, we’re seeing the return of multiple offer situations and “bidding wars.” So I thought it might be helpful to write up an explanation of how multiple offer situations work, with some recommendations as to how sellers and agents should handle them. A “multiple offer situation” is simply one where two or more buyers are making simultaneous offers on the same listing. Right now, our local markets have inventory shortages: too many buyers are chasing too few listings. So until we start seeing more homes come onto the market, we’re likely to continue to see these types of situations. When a listing agent gets multiple offers on a listing, she doesn’t generally negotiate separately with each buyer, because managing several competing negotiating tracks can be complicated and messy. Instead, most agents announce to all the buyers that they have a “multiple offer situation” and invite the buyers to make their “Highest, Best, and Final” offer by a particular deadline. The buyer agents then confer with their buyers, and submit their best offers by the deadline. The seller then reviews the offers, compares them, accepts the best offer, and instructs her agent to notify the buyers accordingly. “Highest” — refers to the price, which is obviously the most important consideration in most bidding wars. “Best” — refers to the other terms, such as financing, closing date, etc. “Highest” doesn’t always mean “Best,” since sellers will often sacrifice a bit on price to get better terms otherwise. For example, an all-cash offer might not be the “highest” offer, but it could be the “best” offer if the seller is concerned with the house appraising out or the higher-priced buyer securing financing. “Final” — refers to the fact that the process is supposed toonly include one round of bidding, so that buyers should make their very highest and best offers because they’re not going to get a chance to improve their bid. Most agents follow the “Highest, Best, and Final” showdown-style process for a couple of reasons. For one thing, it’s a pretty well-accepted standard in the industry, so most buyer agents are comfortable with it and familiar with how it works. For another, it’s simple and quick: you solicit the best offers, review them, and make a decision. You don’t end up in a long, drawn-out process. And most agents think that using the “Highest, Best, and Final” process drives buyers to “put their best foot forward,” making the best offer they can to ensure that they have the best possible chance to win the bidding war. In practice, though, the “Highest, Best, and Final” process has a number of problems. Let me explain why. With everything else being equal, the seller will likely take the offer with the highest price, so she chooses Buyer C with $515,000. The listing agent notifies all the buyers of the decision, Buyer C orders inspections, the parties start the contract process, and the losing buyers become “backup offers” in case Buyer C’s deal falls apart. And that’s how the process is supposed to work. In practice, though, that’s not how the process often plays out. In a lot of cases, the losing buyers don’t accept the “Final” part of the “Highest, Best, and Final” showdown. Instead, once they find out that they lost the bidding war, they improve their bid. For example, let’s say that in our hypothetical, Buyers B and C made their best possible offers. But Buyer A didn’t. Buyer A really wanted the house, and was willing to go to $525,000, but thought he didn’t have to. If he’d known that someone else was going to outbid him, he would have maxed out his offer at $525,000.So when Buyer A finds out that he lost, he immediately tells his agent to present a new offer, this time for $525,000, his maximum. What happens then? Well, the listing agent has a fiduciary obligation to present all offers, even after the seller has accepted an offer, so unless the seller has specifically instructed her to not present offers after the bidding war is completed, she has to present Buyer A’s revised offer. And, most likely, the seller will accept it. After all, it’s now $10,000 higher than the offer she accepted from Buyer C.
So think about what happened. The listing agent represented to all the buyers that this was a “Highest, Best, and Final” process, which means that she’s not supposed to entertain counter-offers once that round of bidding is over. But because she’s legally bound to present all offers to her seller, she couldn’t uphold the integrity of the “Highest, Best, and Final” process. Now, the listing agent has to call back Buyer C and tell her that the deal is off. This is a very unpleasant conversation, because Buyer C had every right to expect that the seller would abide by her own process. And that’s the biggest problem with the “Highest, Best, and Final” process: buyers often don’t present their best offers. Instead, they “game” the system to make what they think will be the lowest offer that will still win the bidding war, and in many cases lose because they miscalculate. And when they lose, they break the integrity of the process to improve their offers. That’s why we recommend that our agents and sellers follow a modified version of the traditional process. Rather than a “Highest, Best, and Final” process, we recommend a “Highest, Best, and NOT Final” process. Here’s the difference. In the “Highest, Best, and NOT Final” process, buyers in a multiple bid situation are encouraged to make their “Highest and Best” offer by the deadline, but are specifically instructed that this round of bidding may not be the “Final” round. Instead, once all the bids are in, the seller reviews them, selects the best offer, and then notifies the losing buyers that they were outbid. But rather than ending the process right there, the seller (through her agent) encourages the losing buyers to improve their offers through another round of bidding. 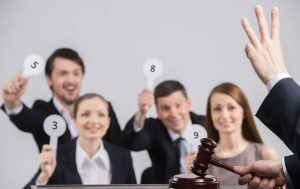 The seller then selects Buyer C’s offer as the “Highest and Best” offer, and notifies Buyer A and Buyer B that they’ve been outbid, but can improve their offers if they wish by making another bid at a new deadline. Let’s say Buyer B decides that she’s out, she can’t go any higher. But Buyer A, realizing that he miscalculated about what he needed to do, raises his bid to $525,000. Now, the seller goes back to Buyer C, tells her that she got outbid, and encourages her to improve her offer by a new deadline. If Buyer C does, and beats out that $525,000 offer, then it’s back to Buyer A for another bid. And so on. First, the “right” buyer wins the bidding war. By the “right” buyer, we mean the buyer who is willing to offer the best terms. The “Final” process often prevents this from happening, because too many buyers “game” their bid based on what they think will be enough to win — and they miscalculate. And if they don’t get another chance to make an improved offer, then they lose out, even though they were willing to go higher. Second, the seller gets better terms. From the listing agent’s perspective, the purpose of the multiple bid process is to ensure that the seller gets the best terms possible. But if even one buyer “games” the bid in a “Highest, Best, and Final” process, then the seller is going to leave money on the table. Like, in our example, the seller accepted a $515,000 offer when a losing buyer was willing to go higher, but didn’t think he had to. From an economic perspective, this is very inefficient. Third, the process maintains integrity. If we inform buyers right from the start that the “Highest and Best” process is “NOT Final,” then everyone is aware that losing bidders are going to get a chance to improve their offers. You don’t get any of the sour feelings that invariably develop in the “Highest, Best, and Final” process when sellers accept offers in an un-announced second round of bidding. Ultimately, at Rand Realty, we work for our clients, and owe them a fiduciary duty of loyalty. So if our seller wants to follow a “Highest, Best, and Final” process simply to keep matters a straightforward as possible, then we’ll do what she wants. But we did want our clients to at least be aware of an alternative the standard process: the idea that sellers could explicitly follow a “Highest, Best, and NOT Final” process to manage their bidding wars. If you have any further questions, please discuss them with your Rand agent.